Considering current climatic patterns, estimating carbon emissions for the next 100 years and future changes to ecosystems to produce one model sounds difficult doesn’t it? Well these are the major factors that climatologists have to consider when constructing climate models. These models can then be adjusted and used to predict the impact of climate change on the habitat on individual organisms. Dr Rebecca Harris, from the University of Tasmania, has to consider all of the variables that exist in each of these considerations. Once she has grappled with these variables she has to choose an appropriate model for a particular species. In a recent seminar Dr Harris revealed some of the fundamental differences in the approach to science that exist between climatologists and ecologists. For example: as an ecologist an error margin is just part of the results, she said. However, errors for climatologists represent an unthinkable situation – mistakes in their algorithms. Dr Harris is one of the brave few scientists who is trying to bring some ecology to climatology and some climatology to ecology. It is hoped that this will improve models of species distribution modelling as well as global climate models (GCMs). Global climate models are computer programs that project future climates based on rainfall, temperature, winds and carbon emission patterns. The end product will look similar to the figure above, only the patterns change across time. From these models climatologists are able to discern changes in climatic conditions that may occur over the next 50 or 100 years. To help improve the accuracy of climate models, they can be run at best and worst case scenario, in terms of carbon emissions, as well as anything in between. Unfortunately to understand many of the guidelines in place we have to descend into the dark world of acronyms. 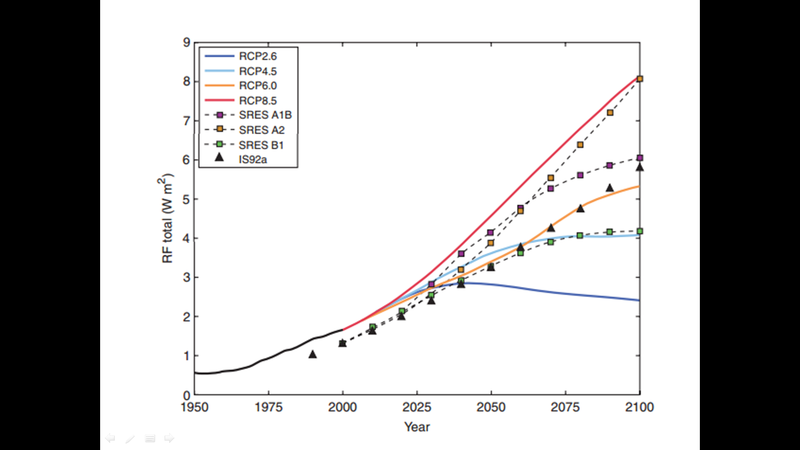 Every few years the Intergovernmental Panel on Climate Change (IPCC) release a statement about the different emission scenarios that they predict are likely. Some earlier GCMs are based on assessment report four (AR4), which listed 4 likely scenarios (A1, A2, B1 & B2 – see the IPCC website for information about the situations that lead to these scenarios). By 2014 another set of guidelines was released (surprisingly – AR5) which changed the likely scenarios slightly. The frightening fact is that we have been tracking at the highest scenario from 1990 to the present day¹. This graph shows the amount of heating that will occur at the different carbon emission scenarios. The increase in temperature is influenced by radiative forcing. Radiative forcing is the difference between short wave and long wave radiation coming to earth. Radiation from the sun enters the atmosphere as short wave radiation. Short wave radiation can penetrate greenhouse gases. When the short wave radiation hits the ground it warms the earth, which increases the amount of long wave radiation emitted from the earth. Long wave radiation cannot penetrate the layer of greenhouse gases and so it is reflected back to earth, which results in a temperature increase. Image sourced from Harris et al (2014). 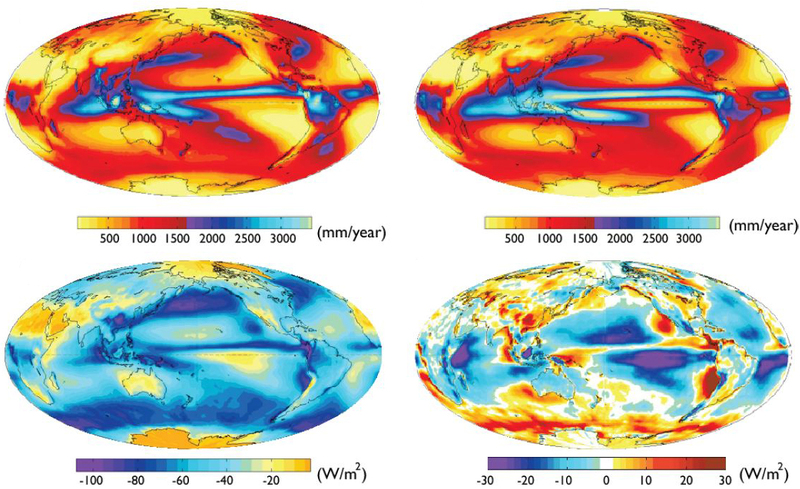 The newer global climate models are based on these scenarios. To date over 50 GCMs have been archived in the IPCC for use by scientists and politicians. These newer models also incorporate additional information which tries to predict the influence of land use and natural disasters on the climate system – adding yet more variables². It is these variables, the huge number of assumptions and their inaccuracy at certain topographies that have led some to question the accuracy of GCMs as well as their validity³. Unfortunately there is an unknown level of uncertainty when using climate models, and it could be argued that the variables that will alter the climate are too random to be predicted. However, despite the limitations of GCMs, they remain the most useful and compete tool for estimating the impacts of climate change on specific species and ecosystems. However one last alteration needs to be made to GCMs for them to have ecological or local significance. The models need to be downscaled. Most models work on a grid of 50-100km, which is not at all helpful in an ecological sense. There are various methods used to downscale the models, which adds yet more scope for differences in conclusions. Finally, once the models have been downscaled they can be used to model potential habitats for specific species during climate change. These can also be used to predict the lack of snow that will fall in 2050 (Click here for the SMH article) or the frequency and severity of cyclones⁴. In conclusion, climate modelling gives us a possible range of possible scenarios that may exist in the next century due to the impacts of anthropogenic climate change. Despite possible inaccuracies, GCMs will provide valuable information that may help us limit the damage that will occur to the environment. Hopefully the information garnered from these models will prompt all of us to try and aim for the best case scenario. Should the data generated from GCMs be used to set up a conservation plan for a single species? Or would we be better served trying to focus conservation efforts on the low trophic levels and keystone species to try and conserve the entire ecosystem? Is either a realistic goal? Are more wholesale changes necessary? Harris, R. M. B., Grose, M. R., Lee, G., Bindoff, N. L., Porfirio, L. L. & Fox-Hughes, P. 2014. Climate projections for ecologists. Wiley Interdisciplinary Reviews: Climate Change, 5, 621-637. 1. Rahmstorf, S., Cazenave, A., Church, J. A., Hansen, J. E., Keeling, R. F., Parker, D. E. & Somerville, R. C. J. 2007. Recent Climate Observations Compared to Projections. Science, 316, 709-709. 2. Pielke, R. A., Pitman, A., Niyogi, D., Mahmood, R., McAlpine, C., Hossain, F., Goldewijk, K. K., Nair, U., Betts, R., Fall, S., Reichstein, M., Kabat, P. & de Noblet, N. 2011. Land use/land cover changes and climate: modeling analysis and observational evidence. Wiley Interdisciplinary Reviews: Climate Change, 2, 828-850. 3. Refsgaard, J. C., Madsen, H., Andréassian, V., Arnbjerg-Nielsen, K., Davidson, T. A., Drews, M., Hamilton, D. P., Jeppesen, E., Kjellström, E., Olesen, J. E., Sonnenborg, T. O., Trolle, D., Willems, P. & Christensen, J. H. 2014. A framework for testing the ability of models to project climate change and its impacts. Climatic Change, 122, 271-282. 4. Emanuel, K. A. 2013. Downscaling CMIP5 climate models shows increased tropical cyclone activity over the 21st century. Proceedings of the National Academy of Sciences, 110, 12219-12224. ← Scientists and Journalists. The start of a beautiful friendship?